Ok friends, we need to talk about something. There is a word out there that is used, a LOT around food and I believe that it needs to be eliminated from our vocabulary. Now. Skinny Vanilla Latte. Skinny Margarita. Skinny Chai. And then it moves into the word Diet such as Diet Coke–or anything that is meant to be as low in calorie as possible. I will never name any of my recipes with the word “Skinny” in front because I have learned a good hard lesson that the sole purpose of eating is NOT to get skinny, and let me tell you it did not come easy for me, but I am so grateful. For so long, that was the mindset behind everything I put in my mouth. It’s miserable and so counterproductive so please stop it all immediately. Scientifically, this is completely illogical. The reason is that these zero calorie sweeteners are actually messing with our body’s ability to recognize what a real calorie is and so our metabolisms are becoming warped and in turn we may even be gaining weight from consuming so few calories in the end. So these so called “skinny” products are not delivering on their end of the deal at all. Which brings me to my real point of all of this. Our bodies are all so very different. Yes, some people are skinny, thin, that will always be a reality. And some people are not. And that’s okay. But when we decide and size up everything we put into our mouths by the way we hope it will shrink our bodies, well? That’s just not healthy. And the problem is that it is so very common and it is the conversation in our high school cafeterias, with the girls at the gym, and worst of all, in our minds. When we do eat the “real” versions of some of our favorite foods: pizza, ice cream, vanilla lattes, we torment ourselves since we didn’t choose the “skinny” or healthiest option. And that leads us to another big issue. We have started to make the word skinny synonymous with healthy. And like I noted earlier, from the podcast, skinny/diet versions of foods are far from healthy. You are so much better off eating the real deal. So where do we go from here? First and foremost, eliminate the artificial sweeteners. It’s not as easy as it may seem since there are so many names that they go by anymore, but click here to find a list of a lot of the common names for them. When you go to Starbucks, and you really want the Vanilla Latte, GET the Vanilla Latte. Erase the word Skinny from your coffee order! Next up is probably the hardest and will require the most effort. Start transitioning your mindset to eating to nourish, to enjoy, to savor and NOT for the sake of shrinking or to become thinner. Enjoy real foods: fats, real sugar or real food sweeteners such as honey or real maple syrup, cheeses and snacks that don’t have the words “reduced fat” or “light” on the label, and so much more. If your mind starts to be trained in this way, first you will be so much more satisfied. You will feel nourished and you will be able to fully enjoy what you eat. Since you won’t be eating so very little calories, you will have energy that will boost your activity and refresh you. It will be a domino effect, but you just have to work on it–it’s a practice. Find balance, find moderation, eat your veggies, and have your cake and eat it too–no guilt allowed. Perhaps over the next week or so, you may be more sensitive to this topic and realize how unaware you may have been to the “skinny” and food relationship. Know that by your choices, you can say no, you can put an end and you can bring positivity to the way you eat and even to those around you who learn from you! You can start the revolution and you can wipe this concept out completely! 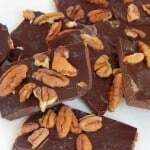 I realized Valentine’s Day is on the way and I guess that means I better share a recipe or two you may want to share with someone sweet! But then again, you may want a sweet treat you don’t have to share as well! 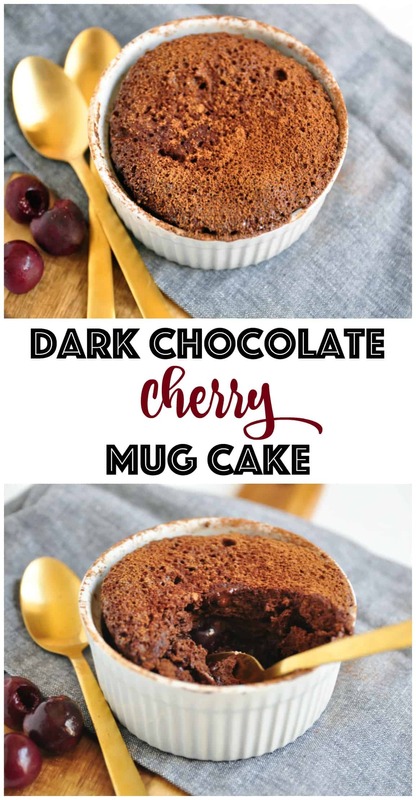 So this Dark Chocolate Cherry Mug Cake is just that. It’s made for two, but there is no rule that anyone needs to share! 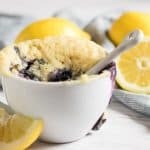 I love a good mug cake first, for the simplicity, but most of all for the miniature version of everyone’s favorite: cake! When I have a sweet craving and cake is what I decide is going to fix it, I don’t really want to spend an hour in the kitchen. So this mug cake solves that issue in a snap. Simply whisk, microwave and serve. Who could ask for more? So this year, you can treat your Valentine with a little cake for two! 1/2 tsp vanilla extract you could use almond extract as well! Add in flour, sea salt, vanilla, maple, and cacao and whisk to combine. 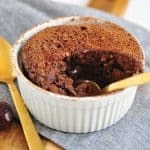 Fold in chocolate chips and cherries. Transfer to a microwave save approx. 2 cup dish or mug. Microwave for 1 min and 30 seconds on high. Allow to cool for a few minutes before serving, and dust with extra cacao if desired. for oven version: preheat oven to 350 degrees F. Use a small approximately 2 cup Ramekin dish and grease lightly with coconut oil. Bake for 10-15 minutes or until a toothpick comes out clean.